My weekend can be summed up in one picture...a cupcake. This year, I made the decision to give up sweets for Lent. This was no small feat for me since I have been known to eat a cupcake for breakfast rather than a healthy, well-balanced meal. In the spirit of full-disclosure, I did have two lapses (once in LA where I HAD to try a Sprinkles cupcake and the second time for my birthday), but all-in-all, I think that I did a good job. 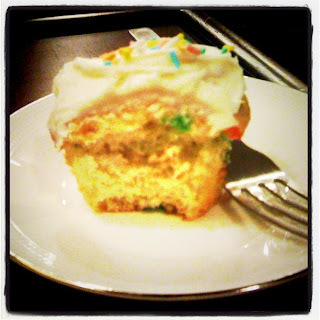 Hubs made me some belated birthday funfetti cupcakes and they were spectacular. Bring on the cadbury eggs! 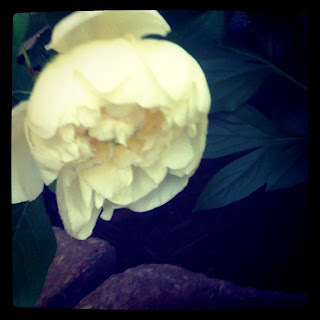 And one more exciting thing: our peony had its first bloom on Sunday. I'm unnaturally obsessed with peonies and they were a must for our home garden. Honestly, I think I'm mostly stoked because we were able to keep a plant alive for more than a few months. This bush survived the blistering summer and harsh winter that Carolina had this past year. What a perfect way to end the Easter weekend!